The Great Race is coming to Grass Valley! June 24th! 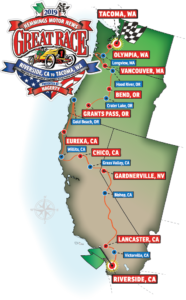 Grass Valley will be a stop on The Great Race. The Great race is a fundraiser for Habitat For Humanity. Each year there is a different route, and this year we are a stop! Come see classic cars as the racers stop and have lunch before racing to the next town! More details to come! Save the Date for Monday June 24th !